【MATERIAL】 Black Imitated Silk Fabric clutch with gold metal frame. "jigsaw puzzle" pattern which is decorated with thousands of crystals(red,green,blue,gold) on both sides. 【CLOSURE AND CHAIN】Gold metal strong clasp closure to keep you miniaccessories safe . There is two metal fixed hooks inside the clutch which is handing the two removable metal chain. Short one(13 inches) for party purses, long one(45.6 inches) for shoulder bag or crossbody bag. 【DIMENSION】 7.9 x 2 x 5.1 inches. Cute Capacity Unique Design Can Comfortably Hold Your cellphone like iphone 7 PLUS, Cosmetic and small accessories. 【OCCASION】 Convertible Multi-use.Three Different Carry Ways for Various Occasions.You Can Simply Use it As a Casual Clutch , party shoulder bag, wedding wristlet purse. PERFECT DESIGN FOR Wedding, Party, Cocktail Ceremony, Daily, Dating. YOU WILL GET A LOT OF COMPLIMENT. 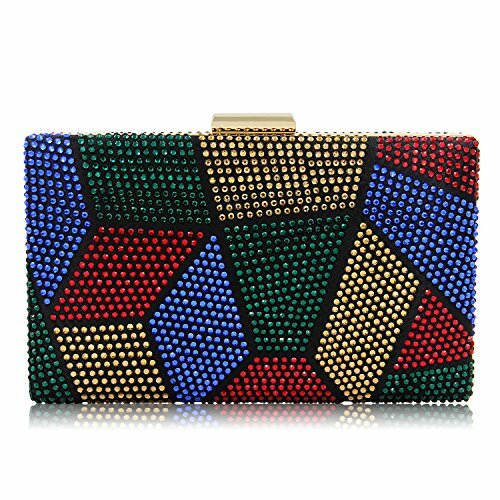 View More In Evening Bags. If you have any questions about this product by Mystic River, contact us by completing and submitting the form below. If you are looking for a specif part number, please include it with your message.